The car is a 1941 Studebaker Champion Custom Coupe (3G-Q3S). Studebaker called it the “double dater” because it had a bench rear seat (no seat and folding “opera seats” were options). It belonged to Ray and Frances Martin, my grandparents. I inherited the car in 2003 when my grandmother passed away but it took until early 2004 before I was finally able to get it back from their home in Jeannette, PA to my home in Columbus, OH. I am still tracking the history of the car. It was built in December of 1940 in South Bend Indiana and shipped to Greensburg, PA on 12/11/1940 and presumably picked up by the first owner (who I have yet to discover). It used to be painted “Dawn Grey”. At some point (probably during or right after the war) it was painted a really ugly dark green. 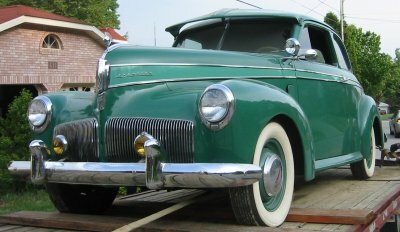 Sometime after returning from World War 2 my grandfather purchased the car. He drove it until 1953 (I still have the 1953 registration card!) when he was issued a company car. At that point he parked the car in the garage where it was used by my Grandmother as an auxiliary closet. Fast forward to 1980. My Grandfather asked my Dad if he could get the car running. Dad did and my Grand-pap became interested in fixing the car up. 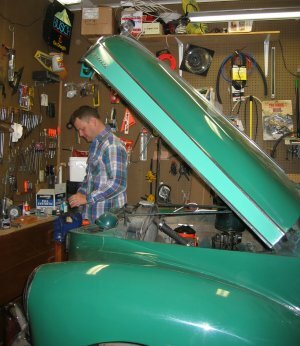 For the next several years Dad would work on the car when we visited. Grand-pap had the body work and paint done at some point. He would drive the car once in a while for fun and did so until he became ill in 1996. After he passed away the car sat until May, 2004 when we were finally able to transport the car to my house. The car is in amazing shape for a 69 year old machine. The last few years of neglect have left some problems that I need to address. I will keep it in driving condition and go cruising. See the following pages for the progress of the car! The car looks like it is getting ready to bite me. Hello, Like you, I inherited my father’s 1941 Champion 2 dr coupe. With my son’s help we hope to keep this car running, (son has it running like a well oiled sewing machine), and carry on my father’s dream taking it to the shows he loved so much. I am fortunate to own the 1941 Shop Manual (Studebaker Bible) he had. Also fortunate to run across your site and blogs! You have a wealth of valuable information here that I am sure will come in handy! Can we say Bookmarked? Thanks! Good to hear. If you have not tried it yet join the SDC and ASC forums. Best source of information out there. We really enjoyed the excellent presentation of your story. Well done. We have recently purchased a 1941 Champion deluxe sedan which we think is probably the only one in Australia. It was built in Cape Town, South Africa, made its way to New South Wales, then to Perth where it was restored. Sold to a bloke in Victoria from a dealer in Adelaide, South Australia. You can understand why the car is very confused! It’s ended up with us in Wodonga , Victoria. We are currently getting the engine up to scratch with the help of some parts sent from the States and the help of a local mechanic. I think your presentation may be of help to him and certainly us in the future as we clock up a few miles. So thanks. If you have any tips on finding parts for our dash they would be handy. Andy and Merran, Wodonga, Victoria, Australia.